Reading 281 And Beyond was a nostalgic ride for me. Out of the former Fab Four of Indian cricket only Rahul Dravid is the odd man out and yet to publish his own story and, with him tied-up with giving back to the sport in the form of nurturing young talent, we won’t see his story out on the bookshelves any time soon. That said with the reputation he has he would love to write his own story in his own words, but only after he is done. Batting legend Sachin Tendulkar was the first of the four to release his autobiography, Playing It My Way, which was a total disappointment. He really played it safe. No revelations, no fact checks and the book felt very rushed. Then last year former skipper Sourav Ganguly released his autobiography, A Century Is Not Enough. I read the first few chapters and I was done. Late 2018, saw the release of another autobiography, from the last member of the elite club. Vangipurappu Venkata Sai Laxman’s 281 And Beyond was out in the stores. 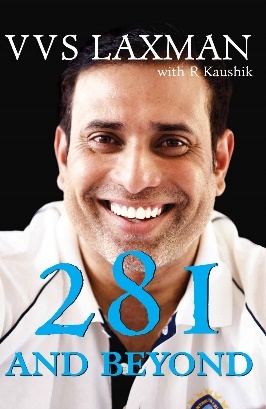 The title of the book has been borrowed from the fabulous knock of 281 against Australia at Eden Gardens in 2001. It was the knock that changed his life, the innings which changed the course of the series and showed the Steve Waugh led Aussies that an Indian team could give it back the Aussie way. VVS missed out on a golden opportunity to be the first Indian cricketer to score a triple hundred in Test cricket, but during that sensational knock the goal set by Laxman and Dravid was to score as many as possible in their side’s hour of need. It was never about the personal achievement. Laxman writes; I walked of the park immensely satisfied. I hadn’t missed out on 300 by 19 runs; I had made 281, in a crisis, with our backs to wall, and put the team in a position from where we could expect to pull off a win against all odds. Isn’t that what you play the game for? Sport was in the blood. Laxman’s father Shantaram had played for Osmania Medical College as an opening batsman and leg-spinner. His maternal grandfather, R Ramananda Rao, was a tennis player who went on to become the vice-president of the Andhra Pradesh Sports Council, and later, Chairman of the Sports Authority of Andhra Pradesh. In addition his maternal uncle Krishna Mohan, used to play in the Hyderabad Cricket Association League. Krishna Mohan had huge influence on Laxman’s career. Laxman’s father Shantaram and his mother Satyabhama were both doctors so academia always had the upper hand in Laxman’s family but neither of them were against sports, so long as it wasn’t at the expense of education. VVS had two career options; cricket or medicine. At the age of 17 he had to make a huge decision in his life. He trusted his inner voice. His heart and soul directed him to the right path, made him follow his passion, the sport he was whole-heartedly committed to – cricket. But everything comes with a condition and here the condition was he had only five precious years in his kit bag after junior college to make it big, to earn the status of an international cricketer. If he had not succeeded he would have gone back to studying medicine. His passion for the sport, his dedication helped him to convert his dream into reality and at the age of 22, on 20th November 1996, VVS was India’s Test cap number 209. All told VVS represented India 134 times in Test cricket and 86 times in ODIs. In a career of 16 years as an Indian cricketer Laxman was committed to the team, he always put the team above himself. The book has in-depth details of his outstanding career as a cricketer. But the writer hasn’t missed those parts of his life where he struggled as a cricketer, his dilemma as an opening batsman and his shutdown mode after missing the bus to the ICC 2003 Cricket World Cup. Any Indian cricketer who played for the national side from 2005 to 2007 who writes his story, would miss out on dealing with Guru Greg (Greg Chappell), the former Australian captain who was appointed as the coach of the national side for a two-year term. And VVS has done the same. VVS was among those who was delighted to work with Chappell. But things didn’t turn out so well for VVS and others. He had his share of scuffle with Guru Greg. A few incidents mentioned in the book clearly show that the team under Guru Greg were suffering. VVS writes; I will always respect Greg Chappell the batsman. Unfortunately, I can’t say the same for Greg Chappell the coach. On the other hand both VVS and the Indian cricket team were successful under the watchful eyes of Gary Kirsten. With Kirsten, India were crowned as the number one Test team in the world and VVS was a proud member of that unit. Especially for someone who never played in a World Cup, this was as good as it got. This was like lifting the World Cup in Test Cricket. All right, so there was no trophy to hold up and no photo-ops, but so what?, says VVS. He had played some wonderful knocks during Kirsten’s tenure, some match winning and some match saving. VVS was Kirsten’s Michael Bevan of Test cricket. 281 And Beyond also touches upon VVS’ white-ball career and with his best partnership, with wife Sailaja. He explains how she stood beside him through thick and thin. VVS also writes about his batting mates, the other three members of the elite club, Sachin, Sourav and Rahul. He has also dedicated a few pages to Virender Sehwag, whom he admires a lot. Personally, I feel there should have been more on Anil Kumble, because VVS and Kumble shared a different camaraderie, they were more than just teammates. The stylish Hyderabadi batsman also expresses his love for playing against and in Australia, and we all know that it is against the Aussies we have seen the best of VVS, whether in Test cricket or limited overs. The book also reveals a few unknown stories about VVS both as a cricketer and as a person. Writing about retirement would have been the most difficult part for VVS. Retirement for him was not easy. During the 2011-12 Test series down under, after losing two games in the four match series VVS started questioning himself, his form, and the time for retirement. He writes; the contours of an inner conflict were beginning to take shape. The real battle was about to begin. He took the right call of not doing anything which would create havoc while the series was on. Following that Australian series India were scheduled to play ten Tests at home against New Zealand, England and Australia. VVS was the part of the squad that was supposed to play New Zealand and had an opportunity of receiving a grand farewell at his home ground in Hyderabad. But farewells and being in the limelight was just not the VVS way. He had already made-up his mind, he was all set to say goodbye to his whites. When I woke up the following morning, it was with a sense of absolute clarity. The press meet was on, and I would retire with immediate effect. No sentimental farewell Test in Hyderabad, no final hurrah in front of family and friends. He was selfless. It was cricket first, always, for VVS. The way VVS smiles on the cover, this book will surely make you smile the VVS way. 281 And Beyond is a delightful read. VVS Laxman is one of the nicest guys in cricket, so much so that I have it on very good authority that he has been described by a former teammate as one of only two cricketers who he would describe as universally liked. A friendly face helps of course, and the broad smile on the dust jacket of 281 And Beyond is certainly that, and whilst the narrative of the book clearly demonstrates that there is a competitive edge to VVS, nothing undermines the initial impression. Not unnaturally the story begins at Eden Gardens in 2001 and India’s famous victory over Steve Waugh’s Australians after having to follow on. The account of that episode is an excellent one, going well beyond a straightforward report of a record breaking innings. There is much I did not know, not least how badly back problems were affecting VVS at the time. Having dealt with that VVS then takes us back to his roots and his youth, before then going through his career in detail. The Indian teams that VVS played in contained some great players. Men like Rahul Dravid, Sachin Tendulkar, Sourav Ganguly and Virender Sehwag grace the pages of 281 And Beyond as they did the cricket grounds of the world. VVS also has much that is good to say about Anil Kumble, Harbhajan Singh and Zaheer Khan as well as, latterly, MS Dhoni. Indian supporters will thoroughly enjoy the book, although it perhaps dwells a little too long on some aspects of the story for the more neutral supporter. Is the book unduly reverential? Possibly at times, but as noted VVS is one of the best of men, and the story is not all joy unconfined, the account of the difficult times when Greg Chappell was appointed coach being an example of that. Form and fitness did not always go the way VVS would have liked, particularly in ODIs, and there are disappointments for him along the way as well as the well known highs. All are painstakingly described. Anyone whose career involves any degree of stress ought to appreciate that being able to make a living out of sport at the highest level is a pressurised occupation. Like many that is something I find easy to overlook, but 281 And Beyond certainly reminded me, although not in a way that I expected. I did wonder, when I first realised that the book was to be published, whether it would mention the two seasons that VVS spent with Lancashire in 2007 and 2009. They were not the most memorable seasons for the Red Rose, although at least relegation was avoided. In the first of them VVS did pretty well, averaging 54.28 in the five matches he managed after his country’s tour. In the second, available for eleven matches, he was rather more effective, averaging 65.92. Prior to reading VVS’ book I had never really approved of these short term stints by overseas players. When I was growing up men like Clive Lloyd and Farokh Engineer became part of the fabric of the Red Rose, and there were others up and down the country; Zaheer Abbas, Mike Procter and Sadiq Mohammad at Gloucestershire to name but three. But all the counties (except Yorkshire of course) had overseas stars who came back year after year. Without giving the question too much thought I had always assumed that in the modern game the trend towards an overseas player flying in for brief visits was a much less satisfactory system. On that question however my eyes have been opened, as VVS explains the pleasure he took from a stint where he could, for a change, concentrate on his cricket without the pressures, stresses and politics of the international game interfering. 281 And Beyond is a well produced book and carries an excellent index. The absence of even the most rudimentary of statistical appendices is disappointing, and a scorecard of the famous Eden Gardens victory would not have gone amiss. That said the photographs are a good selection, generally well chosen and nicely reproduced, albeit a few are frustratingly small. All in all VVS’ autobiography is a decent read, and certainly one of the better Indian autobiographies.